Qiagen has won a Premarket Approval (PMA) supplement expanding FDA authorization of the company’s therascreen EGFR RGQ PCR Kit as a companion diagnostic for Gilotrif (afatinib). The new indication extends the indications for therascreen to include detection of epidermal growth factor receptor (EGFR) mutations L681Q, G719X and S768I, in order to identify non-small cell lung cancer (NSCLC) patients for whom the Boehringer Ingelheim targeted cancer treatment is indicated. “We are pleased to provide benefits to more lung cancer patients with these additional biomarkers in our clinically proven therascreen EGFR RGQ PCR Kit,” Jonathan Arnold, VP and head of Qiagen’s Partnering for Precision Diagnostics unit, said in a statement. “In addition to detecting the most comprehensive panel of EGFR mutations in which the safety and efficacy Gilotrif have been established, the therascreen EGFR RGQ PCR Kit offers laboratories an efficient workflow on the Rotor-Gene Q MDx, the real-time PCR module in our widely-used QIAsymphony family of instruments,” Arnold added. Gilotrif is a kinase inhibitor that was initially approved in 2013 as a first-line treatment for patients with metastatic NSCLC with common EGFR mutations as detected by an FDA-approved test. At the same time, the FDA approved therascreen as a companion diagnostic for Gilotrif. Gilotrif also won approval in 2016 for the additional indication of patients with metastatic, squamous NSCLC progressing after platinum-based chemotherapy. Gilotrif is one of two cancer drugs for which therascreen® EGFR RGQ PCR Kit has been approved for use as a companion diagnostic. The other is AstraZeneca’s Iressa (gefitinib), a tyrosine kinase inhibitor indicated for the first-line treatment of patients with metastatic NSCLC whose tumors have EGFR exon 19 deletions or exon 21 (L858R) substitution mutations as detected by an FDA-approved test. EGFR RGQ PCR Kit is a real-time PCR test intended for qualitative detection of exon 19 deletions and exon 21 (L858R) substitution mutations of the EGFR gene in DNA derived from formalin-fixed paraffin-embedded (FFPE) NSCLC tumor tissue—with the goal of distinguishing between EGFR mutation-negative (wild-type) and EGFR mutant tumors. 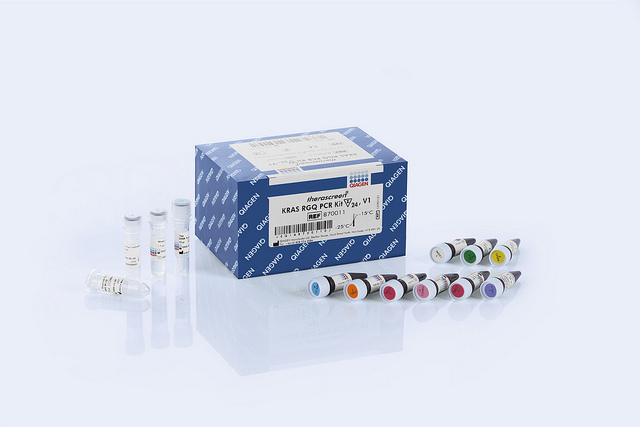 The kit includes reagents designed for rapid and sensitive detection of 21 somatic mutations of the human EGFR gene using the QIAamp DSP DNA FFPE Tissue Kit and the Rotor-Gene Q MDx instrument. Boehringer Ingelheim and AstraZeneca are two of more than 25 biopharmas with which Qiagen is collaborating to develop companion diagnostic tests for drugs as of the end of 2017. This year, Qiagen has said it expects to generate more than five approval submissions to the FDA and / or U.S. launches.